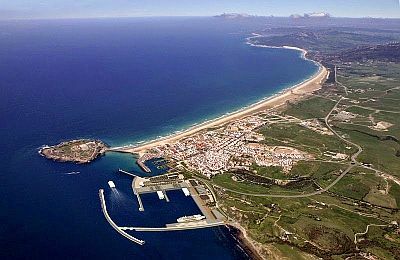 Tarifa, a town on the southern tip of Spain, has a particular climate, cool and windy because of the prevailing winds coming from the sea: the ponente (west wind) and the levante (east wind, more frequent and intense). Because of waves generated by the wind, this part of the coast of Andalusia is particularly appreciated by surfers and kitesurfers. You can also go diving around Isla de las Palomas, the southernmost point of Europe, a small island about 200 meters (650 feet) away from the mainland, to which it is connected by a causeway. The pier of Punta de Tarifa is particularly windy. To the south you can see the coast of Morocco, which is just 15 km (9 mi) away. In the strait that separates Europe from Africa (Strait of Gibraltar), you can watch whales and dolphins. There are very large beaches such as Playa de Los Lances and Valdevalquero. Sometimes the wind is so strong that it can lift the sand. Rainfall amounts to 630 millimeters (25 inches) per year, and follows the Mediterranean pattern, in fact it is more abundant from October to February, when it's equal to or higher than 75 mm (3 in) per month (and during some years it can be plentiful), while it becomes very rare in summer. Winter, from December to February, is a mild season, characterized by sunny periods alternating with periods of bad weather, with wind and rain. The rains during some years can be heavy or frequent. For its southern location, it is sheltered from the cold: the temperature rarely goes below 5 °C (41 °F) at night, and it rarely remains below 10 °C (50 °F) in the daytime. However, the cold record is -3 °C (27 °F), measured on January 28, 2005. Spring, from March to mid-June, is mild, and gradually becomes less rainy and more sunny. Anyway, especially in March and April, there may still be periods of bad weather. In periods of good weather, the east wind, moderate or strong, cools down the air. Summer, from mid-June to mid-September, is mild and sunny, with a bit of haze, and definitely not as warm as in southern Spain. Typically, daytime temperatures are not very high, and remain around 25 °C (77 °F); the air is humid and the east wind blows steadily: at certain times it can be moderate, but at others times it can be very strong for weeks. There may be cooler days, with highs about 20/22 °C (68/72 °F) even in July and August. The highest records are around 35/37 °C (95/99 °F), but African heat waves occur rarely: the temperature may not reach 30 °C (86 °F) for an entire summer. Autumn, from mid-September to November, is mild, and the rains become gradually more frequent. In November, but sometimes also in October, we are well into autumn, with a mild climate, but also cloudy and rainy. 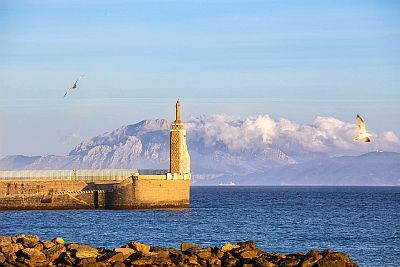 The amount of sunshine in Tarifa is very good in late spring and summer, from May to September, when clear skies prevail (though less than in the rest of Andalusia because sometimes a bit of mist or some cloud banks can form), while it is acceptable in autumn and winter, when, in addition to sunny periods, cloudy and rainy periods are possible. The sea in Tarifa (we are on the border between the Atlantic Ocean and the Mediterranean Sea) remains cool even in summer, in fact it reaches a maximum of 22 °C (72 °F). The best time for a beach holiday in Tarifa is the summer, from June to mid-September. It is worth while to recall that in periods when the wind is stronger, sunbathing on the beach may be unpleasant. It's better to bring a sweatshirt and a scarf (and maybe a windbreaker) for chilly and windy evenings. If you plan to go hiking and walking, especially in the cities of Andalusia such as Seville and Córdoba, you can choose April, May and October, since in that area the summer is very hot.